GERMANY: The German government's draft renewables act revealed a reduced offshore growth plan that raises questions over the industry's viability. 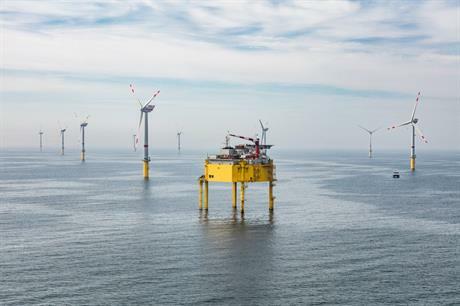 The German government's draft offshore wind act, WindSeeG, revealed earlier this month, suggested lean years ahead for the offshore wind sector. Although the federal government's clearly-defined path towards 15GW in 2030 offers some security to the offshore industry, the draft WindSeeG sets out an average 730MW to be installed annually offshore from 2021. With as much as 7.7GW expected to be installed by 2020 — exceeding the target of 6.5GW — this will fulfill the remaining 7.3GW required to reach the 2030 target, spread evenly across the ten years, the draft law states. A spokesperson for Germany's offshore wind energy foundation noted, however, that for a sustainable industry, 900MW a year is required. Last year, 2,282MW of German offshore capacity was newly commissioned — partly due to projects completed but not commissioned in the previous year — raising the operating offshore fleet to 3,295MW. The draft law confronts the industry with substantial change. A pay-as-bid tendering mechanism will in future fix support payments per kilowatt hour, replacing the current feed-in tariff mechanism. The last projects eligible for the feed-in-tariff must be permitted and have a firm grid connection pledge by the end of 2016 and be commissioned by the end of 2020. From 2025, the federal government will shoulder the development of offshore projects under the "centralised model" within the framework of an area development plan. It will select sites to be developed and put them put up for tender. In the transition period, the government has decided to allow advanced and already permitted projects to compete in the March and December 2017 auctions, each for 1,460MW, and the projects selected will be installed from 2021-2024. Wind energy agency WAB recommended the auctions take place in 2017 and 2019 to be able to price in some of the cost-saving potential to be achieved before 2024, such as new turbine types. The draft has not clarified one highly controversial aspect of the rulings: whether owners of projects unsuccessful in the 2017 bidding will receive any priority in bidding in auctions from 2020, or if they will simply be eliminated without compensation by allowing permits to expire. For those without permits, the permitting process would simply be stopped. The maximum bid allowed in the two 2017 auctions is set at €0.12/kWh. Permitting authority BSH will release the names of eligible projects by 30 November 2016. Regular auctions will start in 2020 for projects due to go online from 2025 under the "centralised model", with the maximum bid set at the lowest successful bid in the second auction currently foreseen by the draft for 2017. The strict limits on tendered volumes and the shift of offshore wind development to the state is expected to enable efficient coordination of offshore wind expansion with construction of the expensive high-voltage direct-current electricity transmission cable systems to the onshore network and reduce unused electricity transmission capacity to a minimum.